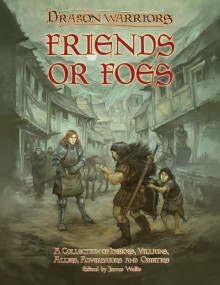 Friends or Foes, the latest supplement for the Dragon Warriors game, has been released. It’s a collection of 36 important and intruiging interlinked non-player characters from the Lands of Legend, all with full game info and adventure-seeds, ready to be dropped into your campaign. You can find Friends or Foes at all good games shops, or download the digital edition direct from RPGNow by clicking this link.